The locations of observations included in the CSC, in equatorial coordinates (click the image for Galactic coordinates). while the color encodes the number of closely-located observations. 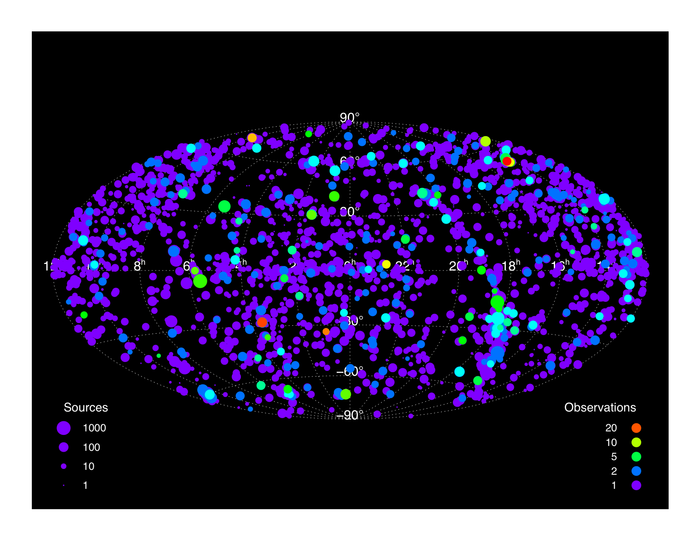 The Chandra Source Catalog (CSC) is ultimately intended to be the definitive catalog of X-ray sources detected by the Chandra X-ray Observatory. To achieve that goal, the catalog will be released to the user community in a series of increments with increasing capability. The first official release of the CSC includes information about sources detected in public ACIS and HRC imaging observations from roughly the first eight years of the Chandra mission. Only point sources, and compact sources, with observed spatial extents <~30 arcseconds, are included. Highly extended sources, and sources located in selected fields containing bright, highly extended sources, are excluded from the first release. The CSC contains positions and multi-band count rates for the sources, as well as derived spatial, spectral, and temporal calibrated source properties that may be compared with data obtained by other telescopes. The CSC also includes associated data products for each source, including images, photon event lists, light curves, and spectra. Each distinct source on the sky (i.e., object at a specific RA and Dec) is recorded in a single "master source" table entry and one or more "source observation" table entries. The individual source entries contain the properties of a single detection from a single observation. The master source entry is the best estimate of all the properties of a source, based on the data extracted from the individual source entries. The Catalog Organization page contains further details. The current version of the catalog is release 1.1. This version includes the information contained in release 1.0.1, plus point and compact source data extracted from HRC imaging observations, and catch-up ACIS observations released publicly prior to the end of 2009. A new version of CSCview is also available with this release. The CSC-SDSS Cross-match Catalog, the CSC Sensitivity Map Service, and the CSC interface to Sky in Google Earth have been updated as of 24 November 2010 to access release 1.1. The Schedule and Status page has the current processing status and release schedule. Users are urged to review the catalog Caveats and Limitations prior to using the CSC for their scientific investigations. Questions about the CSC may be submitted to the CXC Helpdesk; refer also to the FAQs section of the website for answers to frequently asked questions. Users are kindly requested to acknowledge in the acknowledgment section of any resulting publications their use of the Chandra Source Catalog. This will help us greatly to keep track of catalog usage, information that is essential for providing full accountability of our work and services, as well as for planning future services. This research has made use of data obtained from the Chandra Source Catalog, provided by the Chandra X-ray Center (CXC) as part of the Chandra Data Archive. The catalog paper can also be downloaded from here.